Enjoy hanging baskets, just in time for Mothers Day. Get a jump on spring and purchase unusual perennials, annuals and herbs for companion planting or simply to enhance your landscape at our annual plant sale. Purchase plants for your home garden. Enjoy hanging baskets, just in time for Mothers Day. Held on the first weekend in May, the MayFair Plant Sale offers a selection of popular, regional and proven plants as well as new and unusual varieties, accompanied by authoritative horticultural advice. Friday, May 3 (Members only preview sale) 5 - 7 p.m.
Saturday, May 4: 9 a.m. - 3 p.m.
Sunday, May 5: 11 a.m. - 3 p.m. Proceeds from the sale go to Wegerzyn Gardens Foundation to support special projects and programs at Wegerzyn Gardens MetroPark. Visit our website for more information. 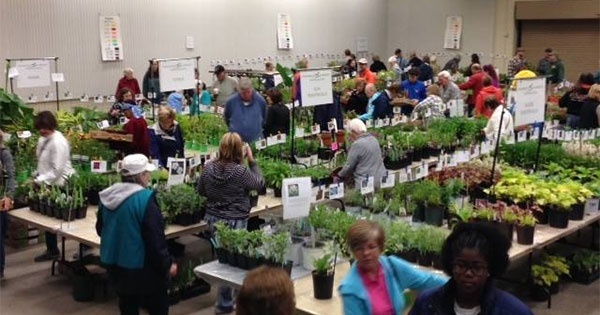 Find more events like "Mayfair Plant Sale at Wegerzyn Gardens"
Five Rivers MetroParks protects the region's natural heritage and provides outdoor experiences that inspire a personal connection with nature. Gain inspiration for your own garden from the unique and beautiful combinations of annuals found in containers scattered throughout the grounds.